If you love pizza (who doesn't?) then you need to eat here. This place was right near our hotel so it was the first place we tried out and it was so good we went back...twice. The pizza is just so authentic and I know we probably should've been trying more Portuguese food but we just couldn't help it. I'm yet to find pizza this good in London. We came to this cute little cafe for breakfast. They had a mixture of healthy and not so healthy brunch options so it's perfect for everyone. I went for the Green Brunch which came with avocado toast, 2 fried eggs, salad, granola yoghurt pot, fruit salad and an orange juice. All for 8 euros. So good for when you can't decide on what to have - just get a bit of everything! My sister went for the waffles which were also mouth-wateringly good. It's super touristy but if you're a fan of the Portuguese tarts you need to get a box from here as it was the original bakery from the 1800s. There's always a queue outside but it goes pretty fast. I'm literally obsessed with these little custards tarts now. I love finding boutique hotels with character and cute details. This place was decorated to perfection. I requested the room with 3 terrace windows and it was such a nice, spacious room. The room looked so grand with it's deep red velvet curtains, chandelier and high ceilings. Rustic wooden floors with mid-century furniture. The hotel was located in Principe Real which is about a 10-15 walk to main stations (Rossio + Rato). Just to warn you - Lisbon is built on a hill so be prepared for some seriously steep uphill walking. The area itself is up and coming with restaurants and boutiques but not somewhere I'd recommend going - unless you're going to the pizzeria of course. Sintra is somewhere you just have to visit when you're in Lisbon. Dedicate a whole day to it if you can. We took the train there (1 hour journey) and used the hop on hop off buses to get around. It's a HUGE place so make sure you research and decide where you want to go beforehand. We took the bus right up to the very top of the mountain to see the castle (insane views) and then hiked our way through the forest down to Quinta de Regaleira. There's a beautiful waterfall, caves and so many exotic plants - it's literally heaven if you're a nature gal. Tip: Wear comfortable shoes/trainers. I made the mistake of wearing sliders and was dying from the 5 hour trek. Sometimes you need a break from all the exploring so we spent a half day at Cacais Beach. It was an hour train journey away from our hotel, just underneath Sintra. It's a small, sandy beach and wasn't packed at all. Take a towel or sunbathe on the beds. There's also a really nice cove - great spot for taking photos. And yes, that is me wearing head to toe black on the beach in 26 degrees heat. Belem is one of the top touristy places to go as the monastery is there as well as the famous pastry shop. We didn't get a chance to go inside the monastery as you need a good couple of hours but it looks beautiful from photos I've seen. We decided to go to the botanical gardens because plants are life. It was 2€ entry and we loved it. It literally felt like I was on an exotic island. The palm trees as you come in are amazing - so instagrammable. There were also so many different types of birds, peacocks and cats - crazy cat lazy alert. Belem is also where you will find the PINK MCDONALDS OMG. My sister spotted it and I got way too excited. I'd seen pictures on pinterest but didn't think it actually existed! No one else really seemed to care but me haha. Most of the buildings in Lisbon are pink. Probably why it's such a trendy city RN. For those that want a bit of nightlife, Alfama is a good area for bars. 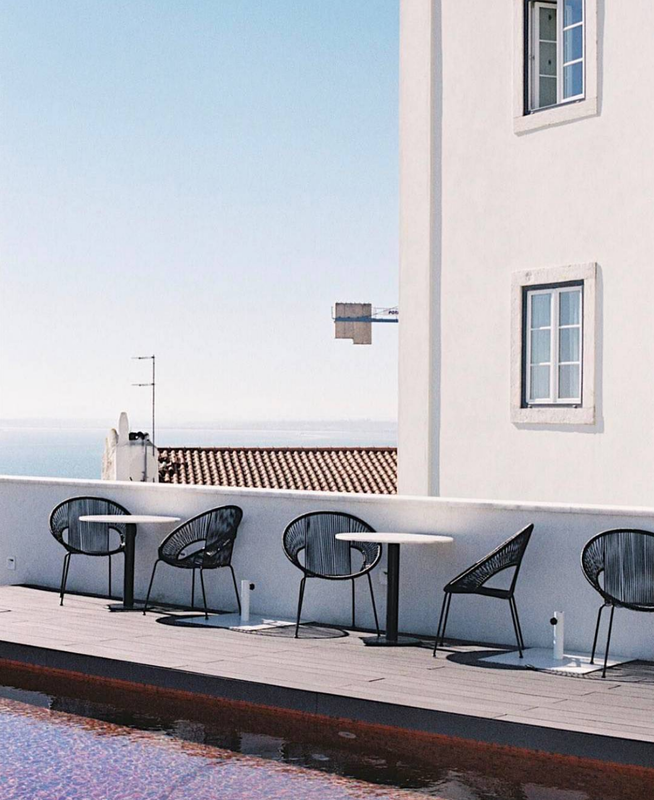 Memmo is a group of hotels in Lisbon with really cool terraces and amazing views over Lisbon. Basically, you need to go to Lisbon. We stayed there for 3 and a half days and I think one more day would've been perfect to really see everything as there's so much to do! The whole city is so picturesque from the pretty buildings to the narrow streets and greenery. Hope this helped any of you that are thinking to go!